Karnataka govt. has announced Gruhalaxmi Crop Loan Scheme in the recent Budget 2019-20 presented by CM H.D Kumaraswamy. Under this scheme, all the farmers would be able to get loans at lesser interest rates on the mortgage of ornaments like gold, silver, platinum etc. Gruhalaxmi Crop Loan Scheme 2019 in Karnataka would help all the farmers in distress and enable them to avail soft loans for their crops. Now farmers will not have to roam here and there to avail loans for crops, they can simpley mortgage their ornaments to get loans at even lower interest rates. This move of the state govt. will reduce the number of suicidal deaths of farmers who die because of their inability to get loans. The entire farming community has welcomed the move of the state govt. to launch Gruhalaxmi Crop Loan Scheme 2019. Under this scheme, farmers can now obtain loans at just 3% interest. For this, farmers will have to mortgage their ornaments / jewellery. However in the recent budget, no specific allocation has been made by the state govt. This Gruhalaxmi Crop Loan Scheme in Karnataka is going to help farmers in crisis situation. Multiple farmer leaders said that the cheapest institutional interest rate is 9% and this scheme is a good move to boost agriculture sector. However, farmers expects more from the chief minister. Karnataka has the most dry land after Rajasthan and is affected by drought for 14 to 18 years since 2001. 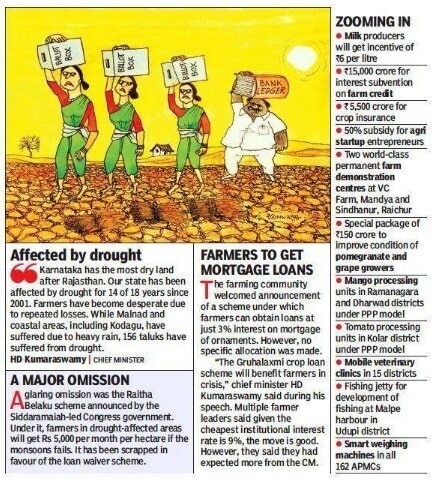 All the farmers have been desperate due to repeated losses. So, the state govt. wants that the financial conditions of the farmers gets improved.